Frozen pipes are a headache that no homeowner wants to deal with. Unfortunately, they’re a real possibility in places with cold winter climates. When the temperature dip below freezing, pipes located along exterior walls and running through unheated areas like basements and crawlspaces are prone to freezing. While there are a number of things you can do to prevent frozen pipes, sometimes even the best efforts fail. First of all, if you have a frozen pipe, don’t panic! Here’s what to do if your pipes freeze this winter. 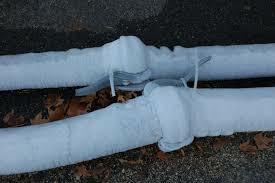 Because water expands as it freezes, frozen water in a pipe can cause a pipe to burst. We recommend giving us a call if you have a frozen pipe, but if you’d rather try handling the problem yourself, here are a few tips. Leave faucets open. As the ice inside the pipe begins to melt, leaving the faucet open allows water to trickle through and speed up the thawing process. Apply heat to the pipe. Wrap towels soaked in hot water or an electric heating pad around the pipe where it’s frozen. You may also heat the pipe using a heat gun or an electric hair dryer. NOTE: Never use a blowtorch or any other device with an open flame! Warm the area up. If you’re having problems with frozen pipes in unheated areas like your basement or attic, use a portable electric space heater to bring up the temperature. Make sure the heater is set up away from flammable objects, and never leave it unattended. Heat your pipes until the water is fully restored. When your water starts to trickle, you still need to apply heat until the pipe is completely thawed. Apply heat until full water pressure is restored. Call for help when you need it. If you have a frozen pipe that is visibly bulging or has already burst, turn off your main water supply and call for help right away. You should also give us a call if you’ve been trying to thaw your pipe with no success. If you need help with frozen pipes in Rochester, New York, depend on G.T. Campbell Plumbing for the service you need. Give us a call at 585-548-0004 for fast, affordable plumbing repair service.